The Intrepid 4x5 MK4 and 8x10 MK2 are two new large format film cameras at a fraction of the price and weight of their traditional counterparts. Both models offer features only usually seen in the high end market, and they are incredibly refined and precise but still affordable and super lightweight. The Intrepid Camera Co. have released impressive upgrades to both models of their large format film cameras simultaneously. 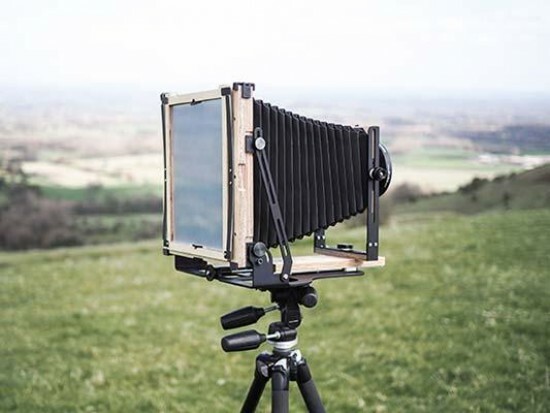 The 4x5 now enters its fourth generation, and the 8x10 its second - both sleeker and much more refined than previous incarnations with features only usually found at the higher end spectrum of the market. Championing the analogue photography comeback, Intrepid are the biggest modern manufacturers of large format film cameras worldwide. Bridging the gap that once placed large format as unobtainable to the average film shooter - oﬀering high quality 4x5 and 8x10 cameras at a fraction of the price and weight of their traditional counterparts. Obvious at first glance on the new cameras is the introduction of the slim black aluminium base, providing an incredibly stable foundation. Screwed directly into the base the focus plate runs on linear metal guides, guaranteeing pin-sharp focus even with maximum bellows extension, or heavy lenses. The focus control - now a single self-locking wheel is then mounted at the rear directly below the ground glass, making it much easier to access and quicker to use. The bellows, made from lightproof-lined vinyl are thicker and more durable than before but still handmade in-house. Holding the ground glass in place are high tension leaf spring clips - a first ever for the 8x10 which now also has 3D printed clips for speedy switching from landscape to portrait. The majority of the manufacturing and all the assembly is still done in-house at Intrepid’s Brighton warehouse on England’s South coast. Parts are locally made where possible, the birch plywood is sustainably sourced and the 3D printer filament is PLA made from renewable resources like corn starch or sugar cane. Versatility is key with every aspect of the new Intrepid cameras - the front standards feature independent controls for rise/fall, tilt and swing movements, the baseplate has universal tripod mounts (1/4” and 3/8”) and you can fold both cameras flat in either landscape or portrait, one of many updates requested by users themselves. Working closely with the film community as a whole has always been at the heart of Intrepid’s ethos and the refinements of the 4x5 MK4 and 8x10 MK2 are evident of the company’s willingness to adapt and grow without losing sight of their audience. Large format allows for you to really take control of your photography, hone your niche or explore diﬀerent techniques. This is where the Intrepids really thrive. In addition to standard 4x5 or 8x10 sheet film you can also use them to shoot instant/Polaroid film, wet plate/collodion, and other experimental processes. The Graflok back of the 4x5 also allows for the use of 120 and panoramic film backs. Both cameras come with a high quality ground glass screen with a 1/2” grid, and tripod mount threads 1/4” and 3/8”. Available to order now with red, blue, black and green bellows.